When many people think of seniors and weight problems, they think of the problem of being underweight. It is true that being significantly underweight is a red flag for possible health problems in the elderly. But geriatrics specialists today are increasingly dealing with the opposite health challenge in the senior population. Most of us are aware of our nation’s obesity epidemic. Health educators have done a good job of publicizing the connection between obesity and health conditions such as heart disease, diabetes and stroke. But many people are unaware that excess body fat also raises the risk of cancer, osteoporosis, dementia and other memory problems, arthritis, hearing loss and depression. For this reason, professional home care agencies are focusing on providing services that help clients not only gain weight if they need to—but also to avoid gaining an unhealthy amount of weight, and even losing a few pounds. Meal planning. As we grow older, our metabolism slows down and we need less fuel for our bodies. But our need for nutrients does not decline. This means that every calorie must count! According to the U.S. Department of Agriculture, “Most older Americans are having trouble fitting the recommended number of daily food group servings into their decreased calorie budgets.” Professional home care agencies work with clients and the client’s healthcare provider to create menus that meet seniors’ nutritional requirements and restrictions (such as low-salt, low-fat or high-fiber). Meal preparation. Grocery shopping and cooking can seem like “just too much trouble” for seniors who are living with mobility, sensory or cognitive impairment. As time goes by, they may find themselves subsisting on frozen meals and packaged snacks. But prepackaged foods are often higher in fat and sodium—and lower in nutrients—than freshly prepared meals. In-home caregivers create appetizing meals and snacks with nutrient-rich fresh ingredients, and can also prepare meals to be eaten later. Encouraging physical activity. A healthy diet is half of the strategy for maintaining a healthy weight. Exercise is the other half. At the 2015 American Geriatrics Association Annual Scientific Meeting, experts reported that a regular physical activity program could prevent disability even in extremely obese older adults. Physical activity burns calories, builds muscle mass and helps control appetite. Professional caregivers remind clients of their exercise program, and can accompany them on a walk or provide transportation to their exercise class. Support for managing health conditions. Arthritis, osteoporosis, strokes and fractures make it harder to be active. A cycle of weight gain can be the result. 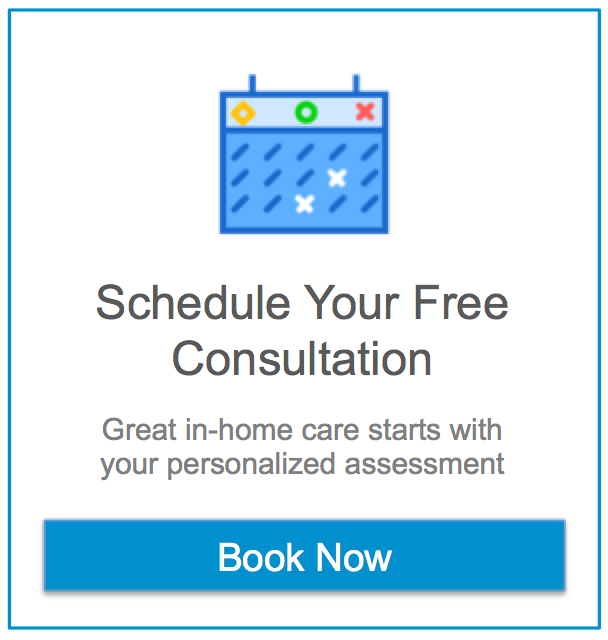 Professional home care agencies help clients and families manage a senior’s healthcare appointments, prescriptions and other health management tasks that the doctor recommends. They can transport senior clients to healthcare appointments and weight-loss classes, and support compliance with the physician’s lifestyle recommendations. Companionship. Many seniors report that they do not eat healthy meals because it’s just too much trouble to cook for one. Geriatricians have long understood that loneliness and isolation can result in an unhealthy weight loss for seniors who live alone—but they now also emphasize that loneliness can also be a risk factor for obesity. An isolated senior may overeat out of boredom, skip meals, and then fill up on junk food. Professional caregivers provide social engagement and human connection—which might well be what a lonely senior truly craves instead of that package of chocolate doughnuts. There is some good news; studies show that being a little bit overweight can be protective against some health problems. But the National Institutes of Health has warned that as our population ages, obesity-related illness will account for an estimate $66 billion in additional healthcare costs by the year 2030. Professional home care might be one of the factors in bringing this number down. With more and more seniors aging in place, home care can provide the resources seniors need to avoid debilitating weight gain.